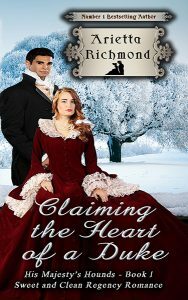 With a very successful series of six Regency romance books (the Derbyshire Set) and more to come in that series, this book is the first in a new Regency romance series. It came about because a series concept and plot ideas just 'arrived' in my head one day, and demanded to be written. Where the other series is a bit 'steamy' this series in in the clean and wholesome/ christian fiction space – so that I can connect with a whole new group of readers. I had the series concept. I sat down to write up the plot for the first book (this one) and the characters just 'came to me'. the further I went with the plot, the more characters, for the whole series, became clear to me. Each is a rounded character, with personality, individual flaws and challenges, individual dreams and motivations. Over the course of the series, you will see more about all of the characters – whilst each book will be able to be read standalone, they will follow an overall story arc, with different main characters in each book, and those characters making appearances in other books. Hunter Barrington, Duke of Melton, had felt the need for some air – even cold winter air. His wanderings had taken him from his own land, into the park of his neighbours. The park seemed larger than he remembered, with cunningly planted thickets, graceful avenues flanked by stately trees, cosy nooks, elegant fountains, well designed flowerbeds and herbaceous borders. Even now, in the depths of the winter, it was not difficult to imagine a profusion of bright colours vying with each other to the beholder’s delight. He remembered the park as he had known it during his childhood: a fascinating tangle of trees, creepers and weeds, which could well become a mysterious jungle, where his friend Kevin, Lord Chester’s son, his brothers and himself, would hunt for wild beasts, find hidden treasures and fight warlike natives. Lord Chester must have hired a new head gardener, Hunter mused. The place had improved beyond recognition. His senses, honed by times when the ability to hear insignificant noises could make the difference between life and death, perceived a slight rustle, as if something were moving between the winter bare bushes, and he stepped abruptly past the branches. To his chagrin, he found himself at less than a foot’s distance from Lady Nerissa, who could not hold back a soft whimper of startlement at his sudden appearance. She smiled, lowering her eyes. He found himself disappointed that she had veiled their green-gold depths from his sight. Her beauty seemed to burn like a flame against the frozen background, composing a jewelled symphony of brilliant shades: gold, silver, coral, aquamarine, mother of pearl, as the cool winter light reflected from the warmth of her skin. Nerissa looked at Hunter under her lowered lashes. He gave an impression of energy and passion kept on a tight leash, like a wild horse straining at restraints. His deep sapphire eyes flashed in a countenance darkened by many seasons spent in warmer climates, his firm mouth and strong chin bespoke character and courage, his lean, hard body and his long, sensitive fingers, made her feel… she could not even name those feelings. No, he was not inoffensive, he was very dangerous, much too dangerous for her own peace of mind, for she had discovered, to her chagrin, that she found him just as attractive now, as she had as an infatuated ten year old. She should go away, but she could not. Mesmerised by his smile, she smiled in return. They walked for a while, making small talk, stealing surreptitious glances at each other, laughing without a real reason, somehow prisoners of the strange enchantment of their unexpected meeting. Nerissa felt as if they were inside a fragile, iridescent bubble and, at the same time, she clearly perceived the terrible impropriety of their situation. Even so, the rebellious mood which had made her fly from home and seek the haven of her beloved park persisted, and made her feel stubborn and daring, enjoying Hunter’s company with a carefree elation. But, while she was tucking a stray, wind-tossed tress under her bonnet, the portfolio she was carrying opened and the sheets inside fluttered and fell to the ground. Hunter was quick to stoop and help her to collect them, but was very surprised when he discovered that they were not the kind of artwork that one was used to expect from a young lady – pastels, gouaches, flowers and landscapes, painstakingly rendered, dull and respectable – but something completely different, something resembling, strangely enough, the neat battle plans he had so often pored over during his soldiering days. Nerissa blushed a deep crimson, and almost wrenched the sheets from his hand. The laughing, relaxed mood of the last hour disappeared in a moment, and she was suddenly tense and distant. “Thank you, Lord Melton,” Nerissa whispered. “I must go now. Goodbye…” and turning quickly, she almost ran away, leaving Hunter bewildered and wondering what all that had been about.